Insomnia is defined as having difficulty falling asleep or staying asleep for long periods of time. This often results in poor sleep quality and a lack of sufficient rest. Most people will experience some form of insomnia at some point in their life. According to the National Institute of Health, approximately 30 percent of the general population experiences insomnia. For most people, insomnia comes in cycles. Initially, those suffering from insomnia may simply have trouble falling asleep. For others, even after falling asleep, they might not be able to stay asleep for an adequate amount of time and may find themselves waking up throughout the night. Side effects of insomnia may include irritability, fatigue, difficulty concentrating, as well as some more serious psychological issues. 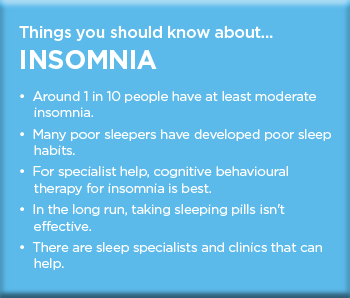 Learn more about the symptoms of insomnia. HOW LONG DOES INSOMNIA LAST? For most, insomnia lasts for only a few days and will resolve itself without treatment. However, anxiety, stress and depression can cause a higher level of insomnia that may last for several weeks. This kind of insomnia requires specialized treatments. 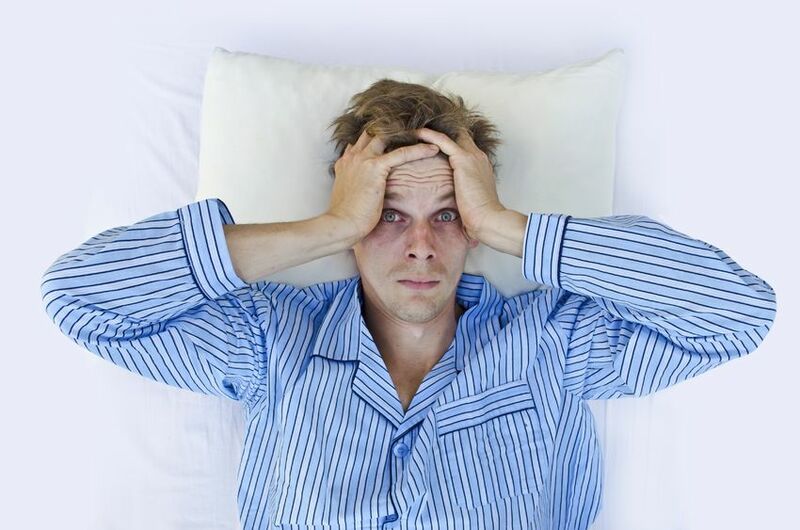 Everyone is different, so the duration of insomnia symptoms depends on the type of insomnia. Primary Insomnia - Primary insomnia stems from environmentally-related causes, such as noise (a snoring bed partner, for example), stress and anxiety, and even jet lag from travelling. Treatment for primary insomnia typically includes lifestyle changes. Secondary Insomnia - Secondary insomnia is associated with pre-existing health conditions or side effects of medication. Asthma, depression, cancer and alcoholism have all been linked to secondary insomnia. Secondary insomnia is often treated with medication or professional sleep therapy. Chronic Insomnia - Chronic insomnia is characterized by 3 nights a week or more of difficulty sleeping. The causes vary from environmental changes to clinical disorders. Some medications, as well, can result in poor sleep quality. The causes of insomnia range from drinking too much coffee to health conditions such as depression and anxiety. Learn more about the causes of insomnia. Insomnia is one of the most common medical problems reported to health professionals. About 30%- 35% of adults have symptoms of insomnia at some point in their lives, and about 10% have chronic insomnia. Among the elderly, insomnia is fairly common due to medication and health problems. Women are twice as likely to experience insomnia due to it’s connection to hormonal changes (such during menstruation, pregnancy and menopause). People suffering some mental health disorders and those of lower socioeconomic status are more likely to experience insomnia. Treatment for insomnia may be as simple as adjusting your sleeping space to be darker and quieter or reducing your caffeine intake before bed. In more serious insomnia cases, sleeping pills or sleep therapy may be required. One option may be cognitive-behavioural therapy, such as SHUT-i, which has been shown to be more effective in the medium and long term than sleeping pills. It’s a structured program that helps you identify and replace thoughts and behaviours that cause sleep problems with habits that promote sound sleep. Cognitive behavioural therapy for insomnia helps you overcome the underlying causes of your sleep problems, teaching you to identify and change beliefs that affect your ability to sleep. The behavioural part of cognitive behavioural therapy for insomnia helps you improve sleep habits and avoid behaviours that prevent you from sleeping well. WHERE AND WHEN SHOULD YOU SEEK HELP? Insomnia can carry many unhealthy side effects ranging from simply inconvenient to life-threatening. If you are having ongoing trouble sleeping to the point that it is affecting your daily life, make sure that you go and see your doctor. Your physician can refer you to a sleep specialist or psychologist. Notice: All medical and therapeutic information and advice contained in this website is necessarily general in nature and may not be appropriate to your particular condition. Consequently, we caution all our readers that the information and advice contained in this website (or in any publication) should be acted or relied upon only after consultation with your physician or sleep clinic.